Abortion is still a difficult, contentious and even unresolved issue for some religious groups. The United Methodist Church provides one example of a religious group whose stand on abortion is not entirely clear. At its quadrennial convention, held in May, church delegates voted to repeal a 40-year-old resolution supporting the Supreme Court’s 1973 Roe v. Wade decision and approved another resolution ending the church’s membership in a pro-abortion rights advocacy group. However, the church’s Book of Discipline (which lays out the denomination’s law and doctrine) stresses that abortion should be, in some cases, legally available. Some religious groups have little or no ambivalence about abortion. For instance, the nation’s largest denomination – the Roman Catholic Church – opposes abortion in all circumstances. The second-largest church, the Southern Baptist Convention, also opposes abortion, although it does allow an exception in cases where the mother’s life is in danger. 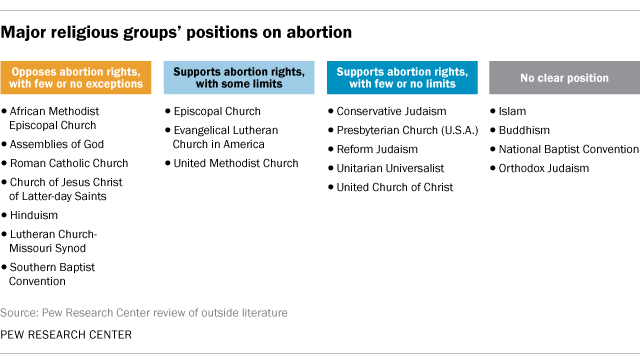 Other sizable religious groups in opposition to abortion with few or no exceptions include the Church of Jesus Christ of Latter-day Saints (Mormons) and the Assemblies of God, the largest U.S. Pentecostal denomination. Hindu teaching also is generally opposed to abortion. On the other side of the debate, a number of religious groups, including the United Church of Christ, the Unitarian Universalist Association and the two largest American Jewish movements – Reform and Conservative Judaism – favor a woman’s right to have an abortion with few or no exceptions. There are several religious groups that have no public position on abortion. For instance, in Islam, which lacks a single organizational authority, there are a range of views among scholars about when life begins and thus when abortion is morally acceptable. Similarly, in Orthodox Judaism there is disagreement among rabbis and scholars about the issue. And for the National Baptist Convention, a historically black Protestant denomination in the U.S., church policy is to allow each individual congregation to determine its views on abortion. Even when a religious institution has a clearly stated policy on abortion, church members may not always agree. For instance, roughly half of all U.S. Catholics (48%) say abortion should be legal in all or most cases, in spite of the Catholic Church’s strong opposition.